A game about fostering cats that are delivered to you daily after you accidentally subscribed to a service online. NOTE: If you have trouble with stuttering audio, please try the downloadable versions. Block deliveries if you have too many cats. You'll lose your bonus, but you might not get overwhelmed by cats. If it's too fast, choose a slower speed in the settings (escape). You can only buy one item at a time, so use quiet periods to do multiple shopping trips. Click on the game to give it keyboard focus. ARROW KEYS and Z/Y (grab/drop) and X (use item/door). Take the box (Z/Y) inside and open it while holding it (X). Fill cat bowl with food when it's empty. Fill litter box with litter. Empty dirty litter box into bin and refill. Leave bins out on the street on bin night (thursday), garbage truck comes every friday morning. Go to the shops to buy supplies. New bowls, litter boxes, cleaning sprays, bins, etc. Go to the adoption center at the far right to see which cats are wanted for adoption. If you have a cat of the same colour, personality, age and with enough hearts you can take it to the adoption center and leave it there. Sadly, there is a lot of problems with growing broke thanks to the fact.... Out of seven cats you cannot adoption out a single one. But good game, it's addicting. Besides giving up and crashes, lags, etc.. IT has a good mechanic I enjoy. 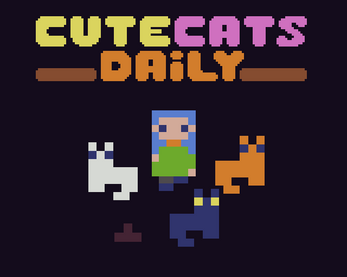 Indeed, it's a pretty broken game, sorry =) Adopting out cats is way too difficult. great game! very challenging. i ran into some bugs where i could no longer pick up the litter box, and then it happened with a cat too. they were both next to a wall, so i think maybe they are getting stuck?